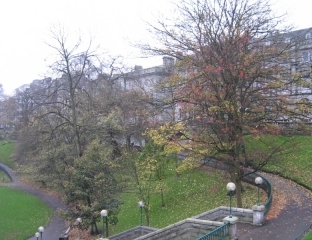 On Wednesday, Councillors approved to proceed with a referendum on the fate of Union Terrace Gardens. After the heated negotiations over the referendum question, as reported in last week’s Aberdeen Voice, the question suggested by the Friends of UTG was eventually considered as appropriate. The poll is to be completed by March 1st 2012, and the result is expected on March 2nd. The referendum will involve a postal ballot, although the possibility of internet voting is being looked at. Voting packs will be issued around Thursday 16th February 2012 and ballot papers must be returned not later than 5.00 pm on Thursday 1st March 2012. Those entitled to vote at this referendum will be those listed in the Electoral Register as local government electors at a qualifying address within the Aberdeen area, and who will have attained the age of 18 on or before 30th November 2012. This means that those currently under the age of 18 but who are entitled to be included in the register in force until November 2012 with a qualifying date against their names will be entitled to vote in the referendum. Qualified voters who are not yet on the register and who wish to vote in the referendum must apply to the Electoral Registration Officer at Woodhill House, Westburn Road,Aberdeen AB16 5GE. Applications must arrive not later than 5.00 pm on Tuesday 10th January 2012. The poll will be organised by an independent administrator, Crawford Langley. Crawford comes highly recommended by those who have worked with him before. He will be responsible for the content of the voting packs to be sent to the electors, including the ballot paper, the counting officer’s statement relating to the referendum, the voter identifier, and statements from any campaigning organisations. Councillors discussed whether the referendum should be binding or not. There are legal issues that mean the referendum strictly can’t be binding. However, in practice it will be effectively binding, as Sir Ian Wood has stated that he will withdraw funding for the project if the public reject it. The Scottish Government have also stated that they will not lend money to the Council if the public do not support it. On March 2nd 2012 the fate of Union Terrace Gardens will be known. The people will at last be allowed to decide what they want their city centre to look like. A Referendum For The City Square Project?